Astronauts sent to Mars on future space missions may have to contend with a toxic chemical known as perchlorate that's thought to be widespread in Red Planet dirt. But perchlorates are already proving problematic for researchers using robots to hunt for possible traces of Martian life, a new study has found. As part of its science mission, NASA's Mars rover Curiosity heats up scoops of Red Planet dirt to test for organic carbon compounds -- the building blocks of life on Earth. "The presence of perchlorates isn't good news for some of the techniques we're currently using with Curiosity," study lead author Daniel Glavin, an astrobiologist at NASA's Goddard Space Flight Center in Greenbelt, Md., said in a statement. "This may change the way we search for organics in the future on Mars." Perchlorates, which are salts comprised of chlorine and oxygen, were first detected in Martian polar soil by NASA's Phoenix lander in May 2008. 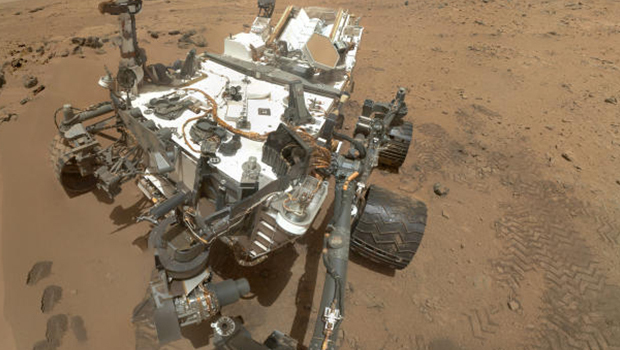 More recently, Curiosity found perchlorates while trekking around the Rocknest sand dune in November 2012. Curiosity's Sample Analysis at Mars (SAM) system uses a pyrolysis gas chromatograph mass spectrometer, which is an instrument that breaks soil down into its chemical components and measures the concentration of each type of molecule. But when perchlorates in these soil samples are heated above 392 degrees Fahrenheit (200 degrees Celsius), they release pure oxygen, the researchers say. This oxygen then causes organic molecules in the sample to combust into carbon dioxide. However, Glavin said not all of the organic carbon would be destroyed in this reaction; some might be preserved inside more heat-resistant materials, or the molecules could possibly be detected before the breakdown of perchlorates. Scientists might be able to account for the organic carbon that has combusted if they assume a certain baseline of perchlorate in Martian dirt, he added. The recent findings at Rocknest could help scientists establish this baseline. "It will be absolutely critical as we move on to other samples to compare them to the Rocknest dune to infer the presence or absence of Martian organic material," Glavin said in a statement. The sandy site dubbed Rocknest is inside Gale Crater, where Curiosity landed in August 2012. Based on the rover's analyses of Rocknest dirt, scientists also reported this week that surface soil on the Red Planet contains about 2 percent water by weight. That means astronauts on Mars could one day extract roughly 2 pints (1 liter) of water out of every cubic foot (0.03 cubic meters) of dirt they dig up. The soil-water study was one of five published in the journal Science on Thursday (Sept. 26) describing what scientists have learned about Martian surface materials from Curiosity's first 100 days on the Red Planet. The study on Martian perchlorates was detailed in the Journal of Geophysical Research: Planets.